You'll never go wrong with a plain area carpet just like what you will see in this list of dining rooms! Adding carpets and rugs in the house is something most people prefer – both for function and decorative purposes. As much as finding the next carpet store is easy, picking the right one for house is another thing to worry about; but fear not since your handy dandy carpet store sales person would very much be eager in helping you out! Below is a list of 20 Beautiful Dining Rooms with Plain Area Carpets which we both know is something similar to the other lists we have posted recently. This list pretty much covers our needs for those plain carpets that just needs to picked out and added to our dining spaces – and the sooner the better! Let us go ahead and start choosing which ones we like on this list, to begin without journey in picking the one for our house. 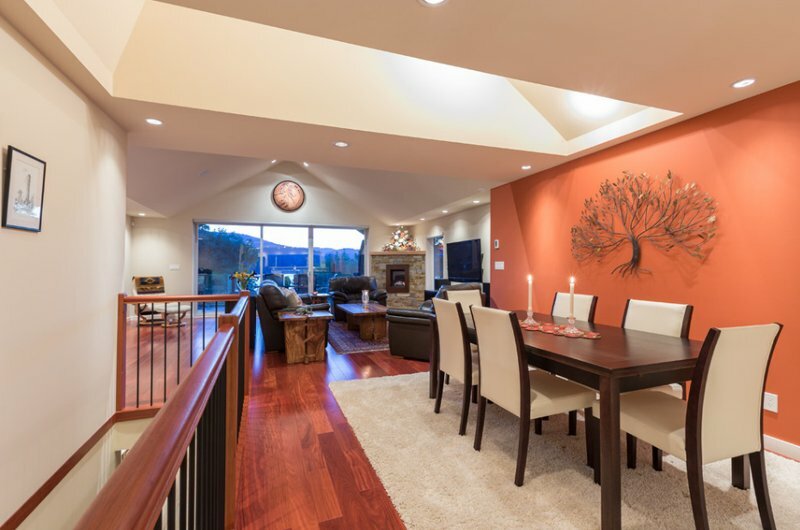 Let us begin this list with a stunning dining room from Terracotta Design. In this photo, we are seeing a beautiful space with white as the decorative color which they added to everything in here. 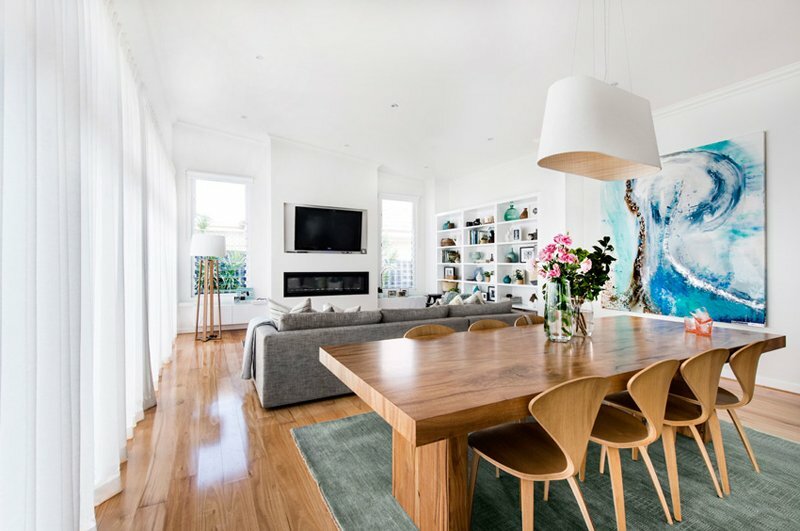 The wooden furniture and flooring is made prettier against all the whites seen in here – don’t you just love it? 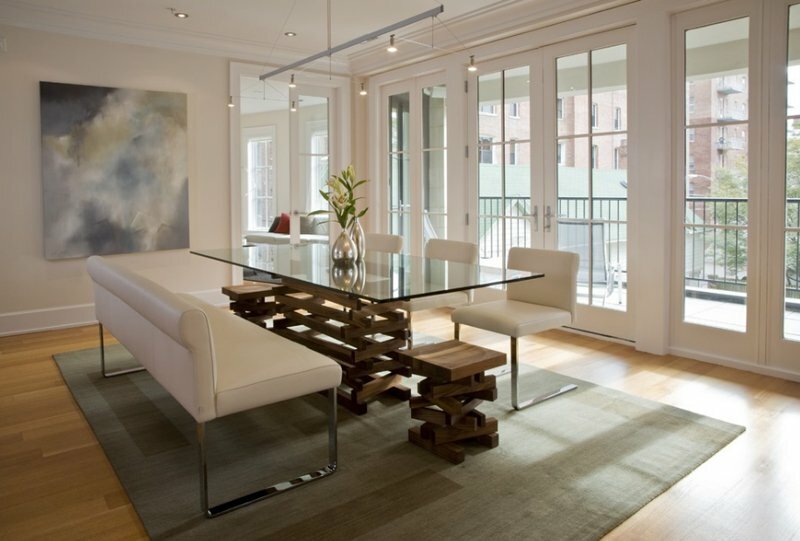 Take note, they used a natural woven carpet for this dining space and it looks fabulous! 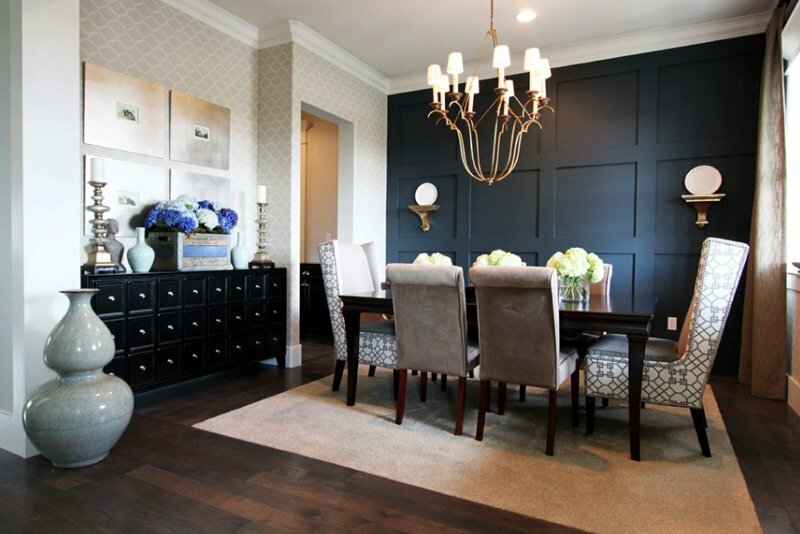 Grey sure looks great in this dining space. Evidently, everything in here sure looks like they definitely wanted grey as the main color; I would assume that they surely wanted to achieve a contemporary space that would look great with white – which is basically all the colors in the color wheel, right? The beautiful dining room chairs in this space are definitely something that people into purples would love! They matched the chairs and the area carpet and it looks totally awesome! I think with a large space like this one, gathering people in here would not be a problem. I totally love the pendant lights seen here – the color looks incredible and its color somehow complement with the other shade of blue seen on the carpet. 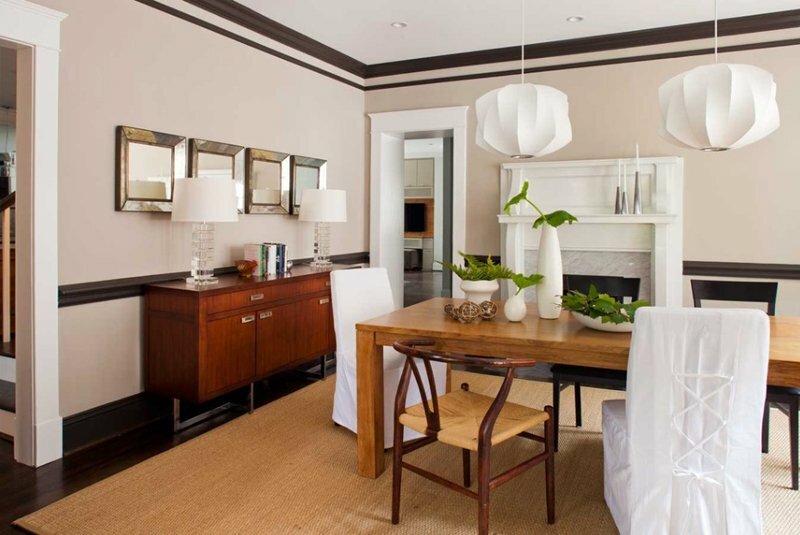 With a small space, Crocus Hill shows us we can surely make our dining rooms pretty even when small is minimal. 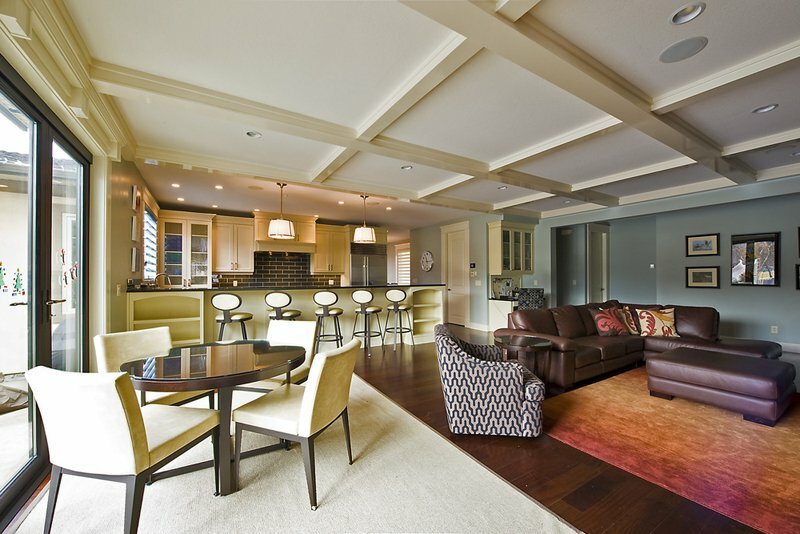 Check out this version of carpet in this Jane Lockhart home. You might notice that it’s velvet and there is print in the middle part of the carpet – this is one plain carpet that you might encounter – it is basically plain in color but has an embossed part that may look like a print. Here is another version of those woven type carpets you’d find in the market today. Many people are actually considering this design because of how earthy it looks and adds just that amount of earthiness your space might actually need. If you notice, this space is in fact contemporary with all this black, white and mocha color that just looks more wonderful because of the woven area carpet. This is another style or design of a woven carpet that I think looks incredible even when it is actually simple. I can’t say that the one before this and this one was weaved with the same way as the other but I think that their material is pretty much the same only done in different colors. I think that this could be the cutest are carpet on this list not only because it’s black, but because it looks really great against the dining room chairs. 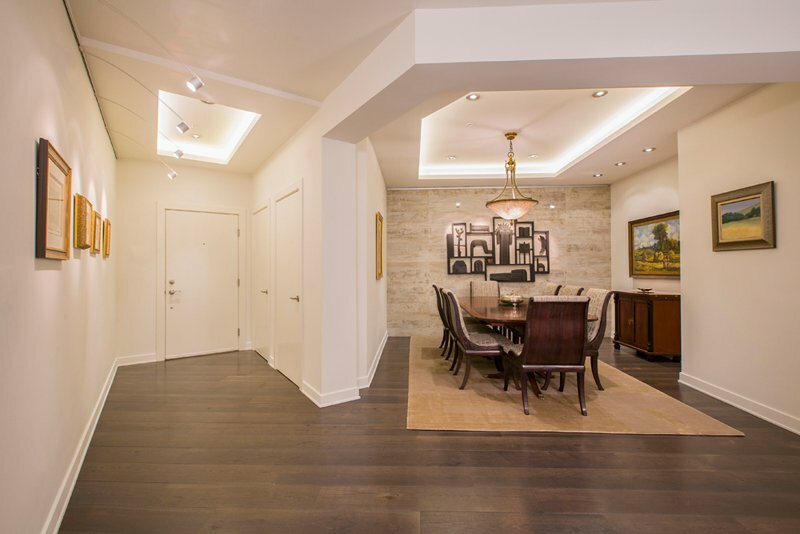 Double check on the entire space for you to fully appreciate the things inside this beautiful dining space! I like how the dining room chairs actually look; they do not look like they are made from 100% wood but it sure look that they do because they totally look incredible. The color of both the table and the chairs plus the flooring somehow sandwich the greenish grey area carpet. 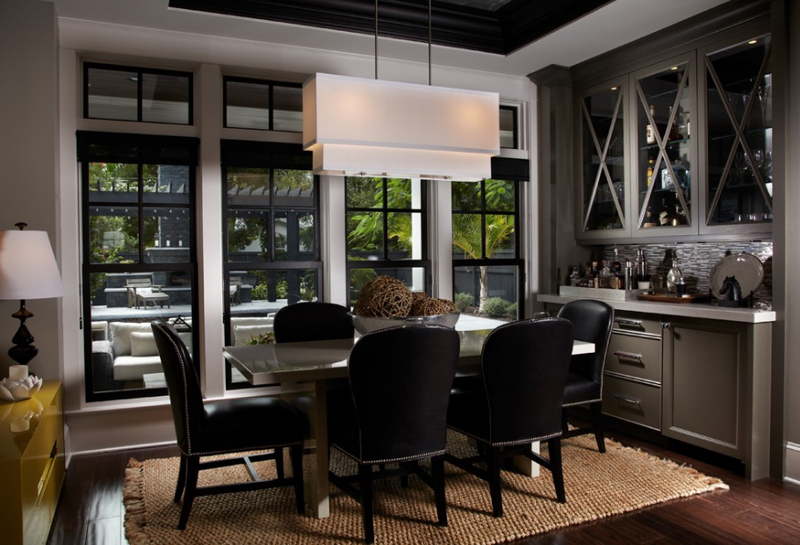 The presence of contrasts on the materials used in this dining room looks incredible; the black, white and light browns look amazing against each other. The shelves on the wall sure needs some love, but this space sure is perfect as it is! With beautiful and large house inspirations like this one, creating your own collage or collection of photos for your dream home would really be easy. If you notice, this home has a very large space and foot traffic was really considered. Great furniture were used to decorate this space and I think it looks totally stunning! 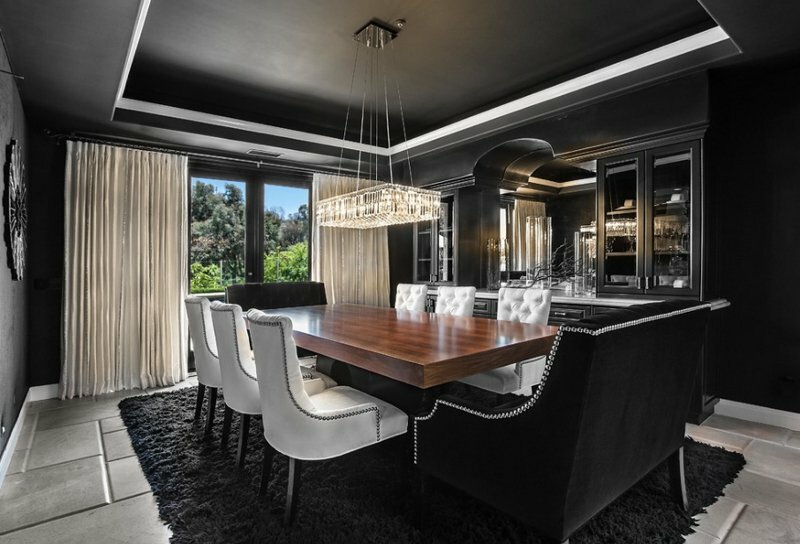 This Orange County home’s dining room looks incredible! Awesome furniture and decoration is seen in here which actually looks a bit of vintage – especially the black buffet table and that large grey-ish vase. How do you like this space guys? Michael Abrams always gives us this adoration feeling towards the designs that they have with their projects. Looking at their work, I’ve seen how sophistication could really go a long way when it comes to home design and especially with the interior works done to it. 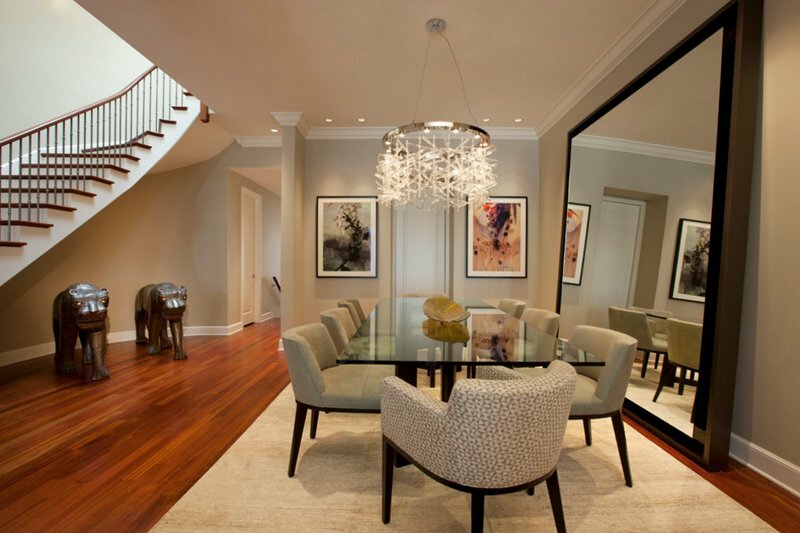 Seeing this dining room for example, I can say how classy this space is even when there are little things in it. Do you notice the yellowish feel of the dining area and the kitchen area and then a hint of purples on the living area? I think that with this open concept, you can easily adore the colors present and the designing methods that the design employed and possibly what the home owner wanted in the first place. The color of the area carpet sure looks quite similar to the color of the dining room chairs. This set up or arrangement is especially great when you have other things that contrast to it – example, in this photo, the area carpet and the dining room chairs contrast with the dark flooring. I am sort of confused as to how this dining room is placed – especially since I was not able to really see the entire floor plan or the arrangement of this house, but I think that this home has added a beautiful dining room set and chose a nice contrasting color for their area carpet. I love how this dining room looks like it is in a picture because of the arch that welcomes you to it. The wainscoting done to the walls and the contrast of the whites and browns in different shades made this space totally adorable as much as it looks regal and classy. I have seen this dining room set up a few times already and I can say that Forma Design always makes me want to check out their site for their works. 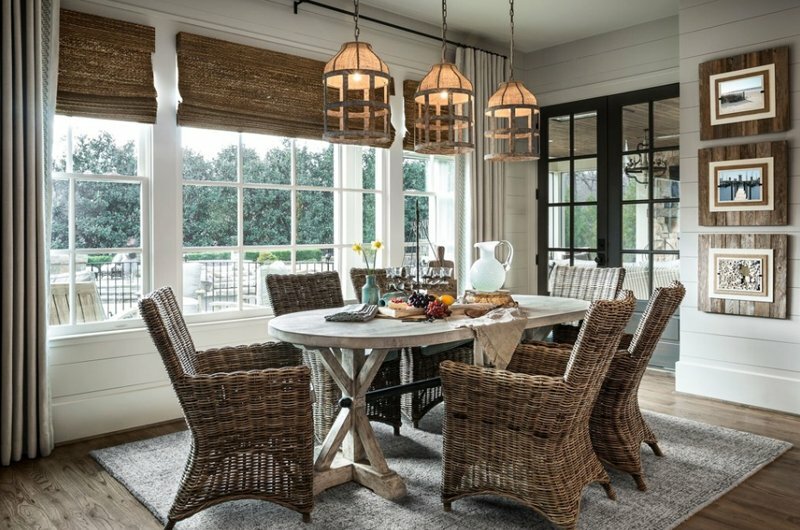 Check out how pretty the chairs are and that stunning table with the small unique stool – can you say that you see beautiful dining room sets like this one every day? I don’t know if you actually like furniture sets with rattan chairs in them inside the house – because most often than not, these chair designs and styles are usually found on the exteriors of the house – like in patios and in the swimming pool areas. Aside from the cool chairs, check out the area carpet that sure looks fun and soft! When you use contrast inside your houses, furniture, decorations and the entire space in general actually looks prettier and classier! Don’t you agree? Check out the way contrast works its magic in this home I think that the design on the wall looks incredible too! 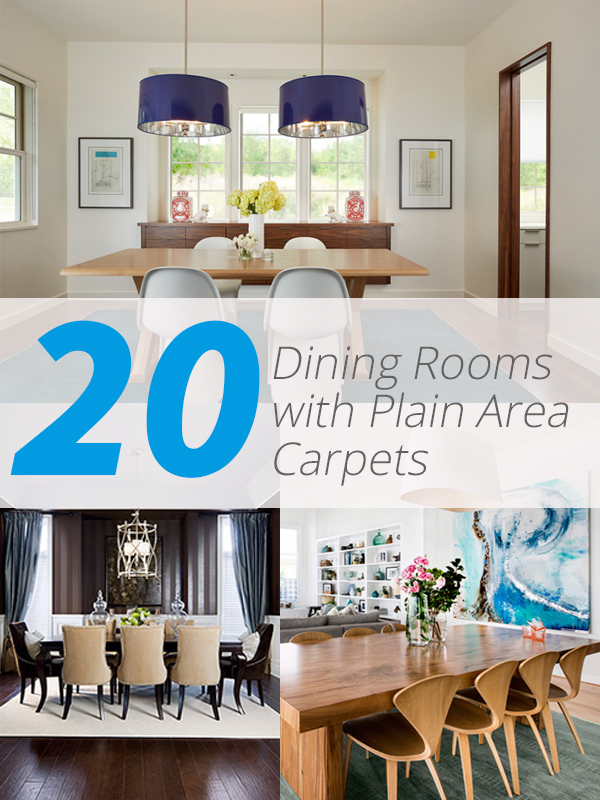 That sums up our list of cool dining rooms that show us show pretty area carpets are – even when they’re simple and they surely add beauty to our spaces, be it in the living room, in the dining room, bedroom, and in even in our bathrooms! This list of 20 Beautiful Dining Rooms with Plain Area Carpets is similar to the list we made before about the 15 Area Rug Designs in Kitchens and they all look stunning!